A pristine stream cascades over the rocks in its path to create a pretty waterfall. 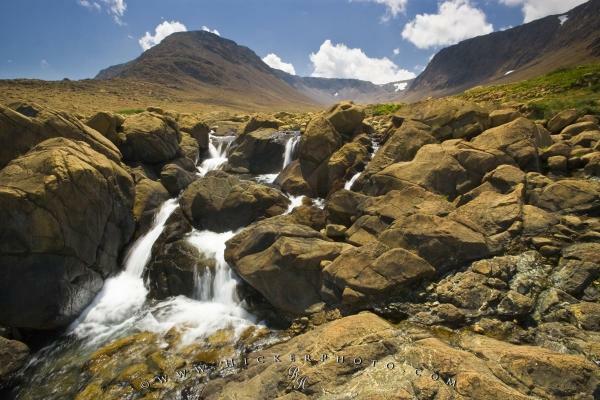 This area of Gros Morne National Park - Tablelands, is steeped in geological treasures and features an area along the trail where the earth's mantle is visible. The earths mantle usually starts around 200 km below our feet on the other side of the earths crust. Along the Tablelands trail in beautiful Gros Morne National Park, the earths mantle is visible and is a geological feature which has attracted scientists to this area the world over. Photo of some interesting geological features in the Tablelands area of Gros Morne National Park, Newfoundland. ... It got here by being forced up to the surface during a plate collision dating back several hundred million years ago. I photographed this photo with the digital SLR camera model Canon EOS-1Ds Mark II, aperture of f/22.0, exposure time of 1/10 sec. on ISO 50, as always I used a original Canon Lens, the focus lenght for this picture was 16mm.